My first handmade loaf. Rye and red fife. I got up this morning planning to fill my apartment with the beautiful scent of baking bread. I have a lovely little bread maker that is my most prized kitchen appliance. Popping all of my ingredients into the pan, I pressed ‘start’ and got ready to walk away (the ultimate perk of a bread machine) when it started to make some very disconcerting noises. Something was not right. It appears that I have killed my bread maker. Taking a moment of silence for my dearest love, I then raced to salvage my lovely organic red fife and rye. 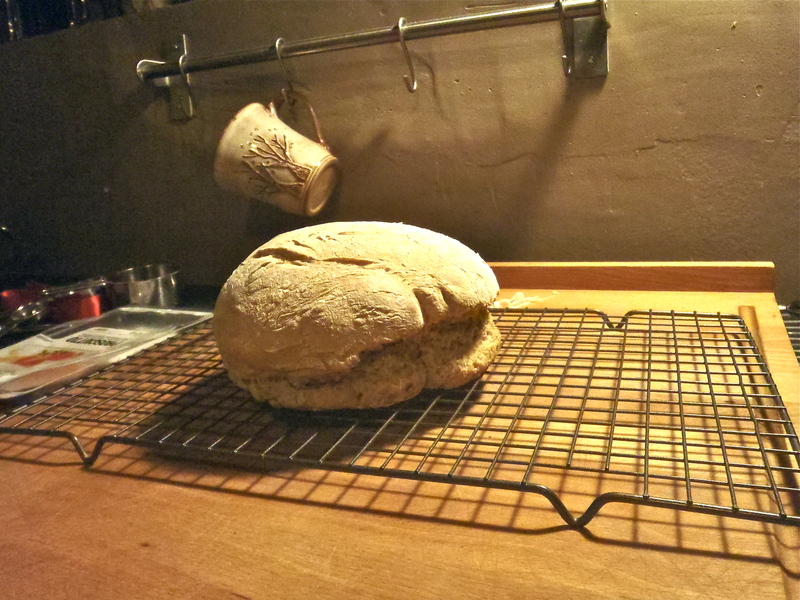 Now was as good a time as any to try my hand at a completely manual loaf. As a baker of pies and tea biscuits and other treats like Irish soda bread, I figured it shouldn’t be too hard. All I can say is thank goodness for the internet. It’s out of the oven now and smelling divine and appears to be finishing up nicely. Only time will tell. But I can’t wait to cut myself a slice and slather it with some sweet unsalted butter. Mm-mmm.